Elegant chocolate bundt cake, with an even, fine crumb, and deep flavor. This chocolate bundt cake is not your run-of-the-mill chocolate cake! In it you’ll find close to 2 cups of strong coffee and a quarter cup of bourbon. Yes you can sub the bourbon for another whisky or for just more coffee. But I do recommend using the bourbon if you have some on hand. Bourbon has a wonderfully smoky flavor, and the cooking process cooks out almost all of the alcohol. So the use of it is more akin to using vanilla, just a different flavor note. The cake will not taste like coffee—the coffee intensifies the chocolate flavor. This recipe comes from my friend Chef Kathi Riley who used to work with Chef Judy Rodgers at the historic Union Hotel in Benicia, California in the early 1980s (pre-Zuni Cafe). This cake recipe was a favorite on the menu there and was served with whipped cream. The cake has an even, fine crumb, has a complex chocolate flavor, and is relatively light. Perfect for pairing with vanilla ice cream. I hope you like it as much as we do! The baking temperature is lower than one would usually use for baking a cake—275°F. 1 Preheat oven, prep bundt pan: Preheat oven to 275°F. Grease inside of a 2-quart bunt pan with a thin layer of butter. Sprinkle cocoa over the butter. Set aside. 3 In a medium bowl, vigorously whisk together the flour and baking soda. 4 In a large mixing bowl, beat the eggs, sugar, and vanilla together until light and foamy (you can use a hand mixer for this, or a stand up mixer). 6 Bake: Pour batter into the prepared bundt pan. Place on the middle rack of the preheated oven. Bake at 275°F for 1 hour 15 minutes, until a tester inserted into the center comes out clean. 7 Cool in the pan for 15 minutes, then gently remove from the pan and cool on a rack until completely cooled to room temperature. 8 Sprinkle with powdered sugar: Transfer cake to a serving platter. Sprinkle with powdered sugar, if using. Slice with a serrated bread knife to serve. Serve with whipped cream or ice cream. Hello! All photos and content are copyright protected. Please do not use our photos without prior written permission. If you wish to republish this recipe, please rewrite the recipe in your own unique words and link back to Chocolate Bundt Cake on Simply Recipes. Thank you! This is a similar recipe to one I used many years ago and have since misplaced, so it was nice to find this. It was a delicious cake, so looking forward to trying it again. The recipe I made years ago called for the addition of raspberry in the batter. Basically, you thawed frozen raspberries then forced them through a sieve to remove the seeds. You would then add half the batter to the pan, add the raspberry puree (running a knife through it to spread it around), then add the remaining batter and bake. The combination of raspberries and chocolate is delicious. I don’t know though if that addition will affect the baking time or not. My general sense is that it won’t, but would love to hear what you think, and if you’ve ever done something similar before. Hi Dennis, I haven’t done that but I’m guessing that you might have to increase the baking time a little. Hi Elise, how long does this cake keep? Can I bake it 2-3 days ahead? Hi Joy, given that typically I make a cake like this and slice from it for days, I would say, yes, it can easily keep several days. Have you tried ‘pan goo’? equal volumes (cups) of trex or Crisco, vegetable oil and flour. you whiz it in the food processor or blender until smooth, and then brush it on. I sometimes have problems with sticking too, even with wonderful nordic ware bundt pans. but using pan goo PLUS on top of that, spraying wilton’s non-stick spray, PLUS leaving the cake in for 15 minutes, plus banging it gently on the counter after 15 minutes, holding it at about a 70 degree angle and turning it round, usually does the trick. I did not have a problem with this particular cake and I used the same pan as Elise, which isn’t the most non-stick nordic ware type there is. I’ve made it twice now. I agree it is such a fabulous recipe it’s definitely worth making even if it does stick! in fact I think I’ll try my hand today, using the Nordic ware Christmas fir trees one! Happy Holidays! Question/Help – I have made this Chocolate Bundt Cake Recipe four times in my non-stick nordicware bundt pan and it never unmolds cleanly. Always sticks. First time I did the butter with cocoa powder. Second time I used less butter then cocoa powder. Third time I used non-stick cooking spray. Fourth time I didn’t use any butter or spray. No luck. I’m a culinary school grad (Le Grand Diplome from Le Cordon Bleu in Paris) so I’m no slouch in the kitchen. Any ideas what I should do? The flavor and crumb of this cake are wonderful so I really want to get this recipe to work! Hi Susan, perhaps you are waiting too long to unmold it? It should be flipped over while the pan is still warm. Other than that I don’t know what to tell you. This has officially and permanently been added to our household’s menu. It has been requested a THIRD time. I don’t mind either as it’s totally enjoyable to make! Just in case they’d be useful here are weight measurements for this recipe. I didn’t get these by going to an online table. Instead I weighed the cups I measured, as I measured them. I measured them by dipping the cup into the flour and pouring the sugar into the cup. (I rounded up also, the actual numbers of grams you get are often hard to remember (eg 283g?!) and even 15g is only a tablespoon!) I find many of the tables are a bit wonky. Alice Medrich has a really good article about weight measurements somewhere on ‘food52.com’, she explains why this is the best way to convert from volume to weight measurements, better than I can. 10 oz/285g flour (could round up to 300g – 15g is only 1 T) NB I used cake flour. Sorry that should probably be 330ml coffee – 3x110ml. I was using a cup with lines only every 50 ml. Again, I don’t think it really matters, 20 ml is a very small amount. I have just found this site and it is very good! I have a bundt cake obsession. So I tried this and it is delicious, a very smooth, consistent texture. I had to use rum though as bourbon is quite expensive here in the UK. But it worked very well. The rather unusual method and the very low oven seem to work really well! I used a mix of some chocolate chips and a bar of 85% chocolate I had. I used the same pan as you, it is very beautiful. The eaters apparently commented on how gorgeous it was! Another question. Do you ever put things in weight, not cup measurements, in your baking recipes? I find it is much easier to get consistent results if that is done. Thanks again for a really good recipe and a delicious cake! Hi Ellen, I’m so glad you liked the cake! I do on occasion include metric measurements. Thank you for your encouragement to me to do it more! I’ve made this twice so far and both times it is absolutely delicious. So rich and decadent. I made a butter-creme icing and shaved some 90% cocao over the top of that. DELICIOUS! L O V E it! Big glass of milk along with it……reminds me of desserts my parents would have on Sundays when I was young! Thanks for the memories and the ability to replicate something that tastes so delicious! Elise the cake looks absolutely wonderful! On a side note – where did you get that beautiful pan??? Hi Robin, thank you! That cake pan is a Nordic Ware Star Shaped bundt pan. I forget where I bought it, isn’t it lovely? I don’t have a bundt pan and don’t really want to get one as it tKes so much room for an unusual mold I don’t think I’d use much. Can I bake it in another pan? In which case what size? Yes, as mentioned in the recipe you can use two 4x8x2 loaf pans. My Festival Bundt pan holds nine cups of batter. Too small for this recipe? Should I go with a standard 12 cup Bundt pan? Hi Julie, good question. I just checked the bundt pan I used again. It holds 11 cups of water, but probably only 9 cups of batter, because the batter needs room to rise. I had said a 2-quart bundt pan was needed, but I think it needs a little more than that, so I’ve updated the recipe to say 2 1/2 quart bundt pan (for about 9 cups of batter). I’ve also made the Chocolate Bourbon Cake before, and will try this one too. 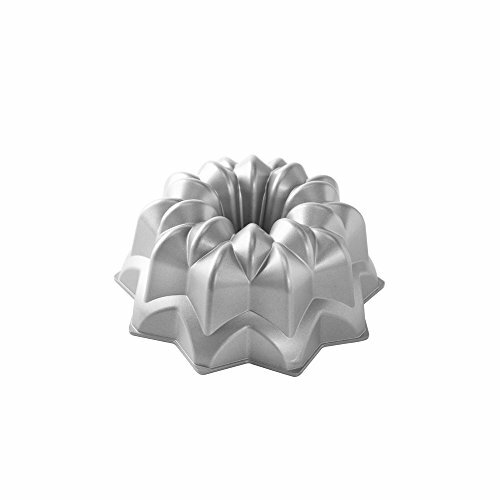 I use a similar Bundt pan, one that looks like a rose and makes everything I bake in it taste better. :) You should be able to find this on or a similar one at a good old-fashioned hardware/housewares store, or perhaps Williams-Sonoma or Sur La Table, or certainly online. They do make everyone who sees the cake go ooh and ahh, and it seems they think you sculpted it yourself! Re the bittersweet chocolate, I assume you mean one with a high percentage of cacao? Also, I usually use a baking spray with flour for my Bundt pan — is that not okay to do with this one? I see that in the Chocolate Bourbon Cake recipe, flour is used to dust the pan, not cocoa. I’ve never dusted a pan with cocoa — is that for color? or flavor? Does it come out of the pan as easily? Thanks. Can’t wait to try this one! Hello Arcey, yes the bittersweet chocolate has a high percentage of cacao. The reason we dust with cocoa powder is for color. It works great! Oh my! This looks really good! Will try making it with GF flour. Wish I had your pretty Bundt pan. That extra pattern at the base adds so much and makes for a pretty slice as well. Please let us know how it turns out with the GF flour. Thanks. I made this for my daughter with “Cup 4 Cup” GF flour that I purchased at Whole Foods. I subbed 1:1 for all purpose flour. The cake was OUTSTANDING and no one had a clue that it was GF. Moist and absolutely delicious. How much 4 ounces butter in kg, ? Hello Kiran, 4 ounces is 113 grams. Note that you can always use Google to find equivalents. Just Google “4 ounces in grams” and you’ll come up with the answer. I use Irish Whiskey and serve it with whipped cream as Irish Coffee cake on St. Patrick’s Day.